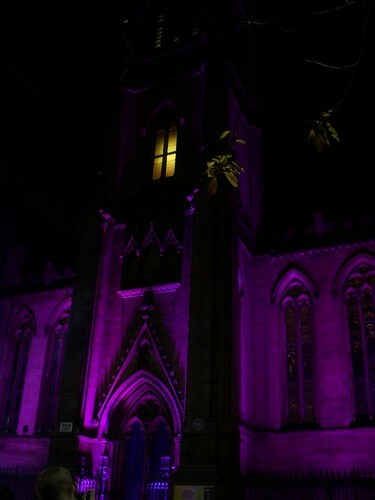 This is the last of my photos from last weekend’s Radiance Festival of light. This is the area outside the St Mungo Museum of Religious Life and Art, just in front of Glasgow Cathedral. I much prefer simple lights like this in trees rather than over-the-top bling – I thought these trees looked really pretty lit up like this. This was possibly the most striking of the Radiance Festival installations I saw – entitled “New Moon”, it was designed by Claire Morgan and (according to the festival blurb) “offers clues both to regeneration, change and the environment … In the context of Radiance, the work signals change and uncertainty.” Not sure about that, but it was certainly eye-catching. The stats: it was 4.3 metres tall, suspended from a 25m tall tower crane, with the contours of the bulb illuminated by hundreds of tiny lights. Actually one of the most striking things about it was as we approached, you could see the full moon underneath it lighting up some clouds which had a really ethereal effect. Unfortunately my photos of that didn’t come out very well, but this one isn’t bad – and I think it gives an idea of some of the more surreal aspects of the festival. Actually I’m not sure if this was part of the Radiance Festival or not but it was just along the road from yesterday’s picture, and caught my eye. 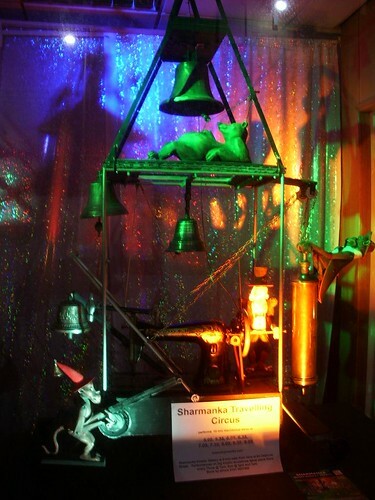 The Sharmanka Travelling Circus was created in 1988 by the Russian Eduard Bersudsky and has been based in Glasgow since 1995. It’s a theatre of “kinetic sculpture”, where hundreds of figures made out of scrap perform a choreography to music and light. This window display was advertising the circus, which is actually based in a different building. Sharmanka is apparently the Russian word for barrel-organ or hurdy-gurdy. I just thought the figures were interesting – full of personality, and slightly creepy with it. I had no idea it existed till I walked past this window on Sunday night – I must check out the actual Circus itself some day. This past weekend Glasgow played host to a festival called Radiance, which showcased a number of light installations in the Merchant City. Over the next few days I’ll show you some of them (mainly selected by the criteria of not being a rubbish photo – as you can imagine, taking pictures of light installations can be a bit hit and miss, especially with a little ‘point and press’ camera like mine!). This first one is of what I thought was a church (presumably it used to be a church) but is now the Ramshorn Theatre. The colours both of the light washing the exterior of the building and of the upper window both regularly changed – in the few minutes I was there I saw reds, blues and greens amongst others. Just behind the Wellington statue (see yesterday’s photo) is the Gallery of Modern Art. I’m a big fan of modern art, but to be honest I often find the GOMA building more rewarding than the exhibits. I understand though that the GOMA has just won some extra funding so I’m looking forward to seeing what art they buy with it. 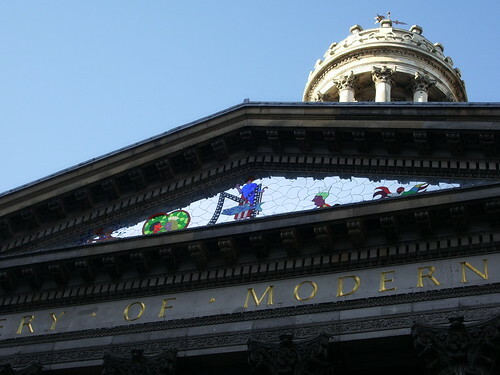 The neoclassical building was built in 1778 as a townhouse for a wealthy tobacco lord, and has had a number of different uses subsequently – for a while it housed the Royal Bank of Scotland, then became the Royal Exchange (the square where the museum is is still known as Royal Exchange Square) which is when it got the cupola and the Corinthian pillars. In the 1950s it housed a library for a while, and it has been the modern art gallery since 1996. If you see any tourist site or leaflet about Glasgow, the chances are it will feature this statue of Wellington, outside the front of the Gallery of Modern Art. It’s not the world’s most riveting statue, but for years now it has been famous because of the (often successful) attempts to give Wellington a traffic cone hat. Sometimes for a change he has a yellow cone, but usually it’s one of these red and white ones – it’s not a small statue, and the cones are pretty heavy, so I think it would actually be quite a feat to get up there to crown him, especially if the person doing the crowning had had a few beers (which I suspect is usually the case!). 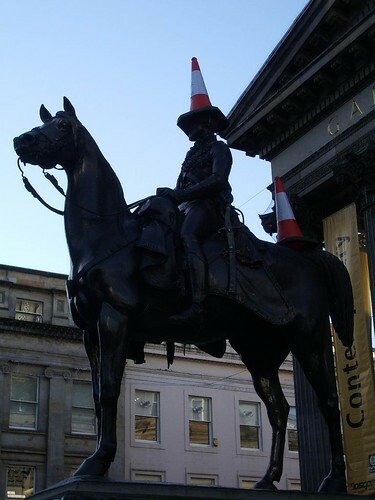 As I understand it, for years the council would have their workers remove the cone, but have now more or less given up, as it is such a Glasgow landmark now and symbol of the Glasgow spirit. There’s even a flickr group dedicated to it! 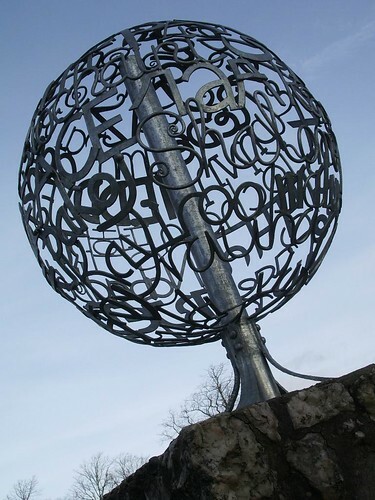 This sculpture is found at the entrance to the kids’ playground at House for an Art Lover in Bellahouston Park (I’ll include pictures and more information about the House another time). It’s made up of the word ‘peace’ in a number of different languages – can you see your language here? I went out and took pictures of some of Glasgow’s Christmas lights this evening, and in December I’ll be featuring the pictures of the lights a fair bit. I was determined not to put the lights on the blog in November (I’m one of those grouchy people who get really cross with the shops being full of Christmas stuff before summer’s over, and leave Christmas shopping till the last minute! 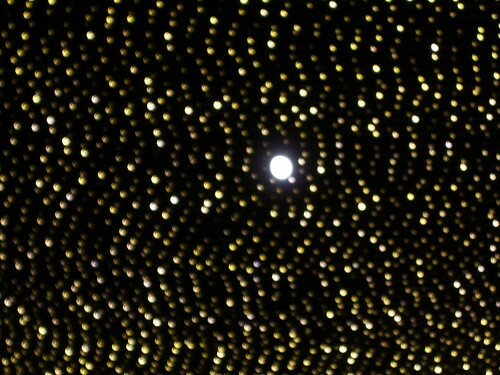 ), but thought I would include this one, which is looking up through the lights that are strung across the walkway at the side of the Gallery of Modern Art. 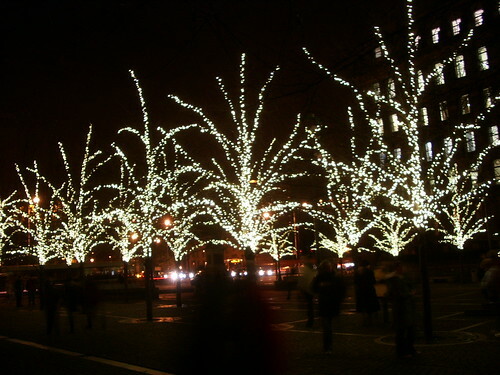 These are my favourite lights – unlike the ones in George Square, these are beautiful and tasteful and I don’t know a single person who doesn’t like them. I’d taken a fair few pictures, and had put my camera away, but as I walked away I happened to look up and saw the moon through the lights. It’s not the sharpest photo (in my defence, it was freezing and I suspect my hands were shaking with the shivering!) 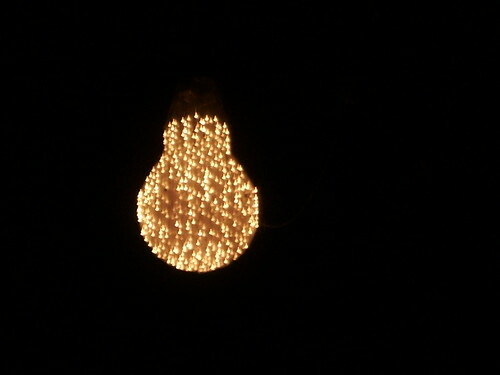 but it does give you a taste of the effect of the lights. It’s been a really wet and miserable day so I didn’t take any pictures, here’s one from the archives instead. Govanhill Glade is a little garden created on a small derelict patch of land not far from where I live. 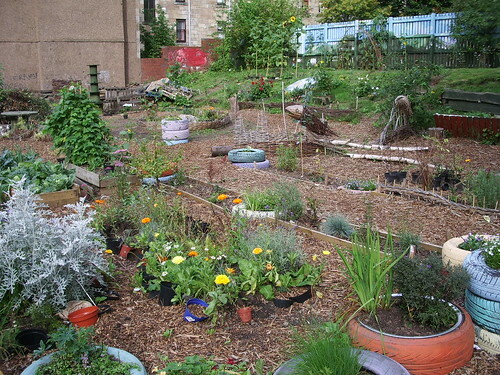 It was created and is maintained for the community by Govanhill Recycling and Environmental Action Team (GREAT), who are part of the Govanhill Housing Association. I love the little splash of colour it provides, as well as the opportunity to take my compostable waste there (living in a tenement flat, we don’t have a green waste service sadly). This picture was taken in autumn of last year. Earlier this year when I took my stuff to the compost bin, I saw that all of the flower beds had disappeared and there were tyre tracks in the ground. Chatting with one of the guys who works for GREAT, it transpired that the land was being targeted for housing redevelopment. I was really upset, and wrote to councillors and both UK and Scottish Parliament members (as did a number of other people who appreciate the garden). From the various replies I got, it seems that the land was always meant to be a temporary garden and that the redevelopment would be aimed at social housing, which I suppose is better than yet more posh unaffordable flats, but I do think it’s so sad that the garden, which is such a lovely community resource (they also provide training and work experience for unemployed youngsters and volunteers doing gardening, courtyard clearance etc), is earmarked for closure and to be built on. At the moment the flower beds have reappeared and the garden is still being faithfully tended – I understand that if the permission for redevelopment goes ahead it will be another year before anything happens, so supposedly there is time to identify other areas where a garden could be created. 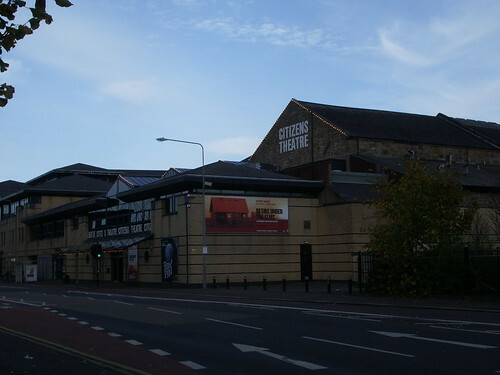 The Citizens Theatre, in the Gorbals area of the city, was established in 1943 with a vision to bring theatre to the people, not reliant on London dramatic supplies but producing home-grown theatre and nurturing home-grown talent that local people otherwise wouldn’t have the chance to see. It has known lots of controversy in its time, and in the 1970s was threatened with the withdrawal of its £12,000 grant from the city council following its support of trade unionists striking against the Industrial Relations Bill. It’s well known for staging experimental and innovative works, and also for being significant in the early careers of many actors who have gone on to greater success (such as Robbie Coltrane). Although it doesn’t look like it, it is based in a (much revamped) Victorian building, and according to Wikipedia is the only theatre in Scotland which still has the original Victorian machinery under the stage.